Our wonderful customers Diana and her husband Scott were nice enough to send us some snapshots of her wearing our J Brand Coated Jeans in Venom! 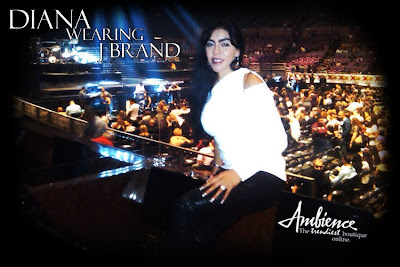 Here she is looking AMAZING at a Mark Anthony concert. Thank you for the photos, and we are so glad that you are enjoying your pants. Wear them well! Our J Brand Coated Jeans have been flying out of the store, we can't keep them in stock! We have a new batch of preorders coming in soon, so if you want yours now be sure to drop us a line at ambience@shopambience.com and reserve your size now.